Cavi-art is produced by Tang-Huset located in Denmark. It’s a unique vegan alternative to caviar that’s made from seaweed from the clean, coastal areas in Brittany and Scotland. It looks and tastes like the real thing, but of course, it’s 100% fish-friendly! The caviar-like “pop” consistency and amazing flavor made Cavi-art a hit in Europe. Cavi-art not only makes the perfect appetizer, it also is an exceptional garnish, since it does not discolor and bleed into dishes the way traditional caviar does. It is an Award-winning product, preferred by top gourmet vegan chefs of Europe. Cavi-Art it can be used in both cold and hot(!) dishes like soups, sauces, pizza, etc. 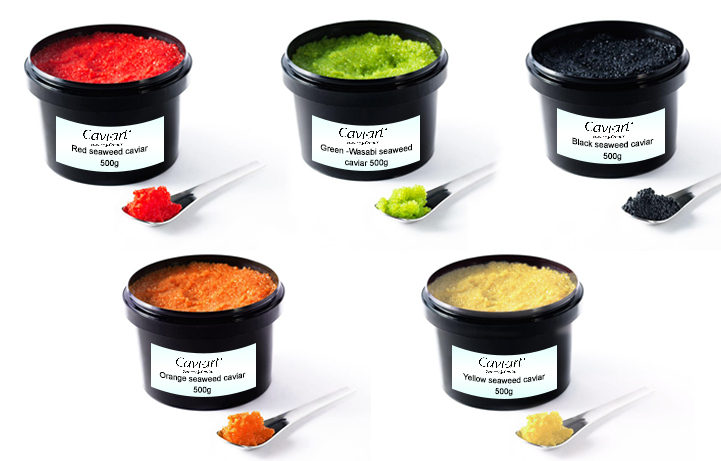 Cavi-Art is very healthy and healthier than traditional caviar due to no cholesterol, no fat, low salt content, Gluten-free, No fish or animal products or Soy. Seaweed is full of healthy and important micro-nutrients and the consumption of seaweed leads to a healthier and longer life.